Members of the KML TinkerCrateClub pause for a photo after making art spinners last month. February Winter Reading Programs were a huge hit! We held raffles, gave out daily prizes and more. If you missed it, don’t worry. We have a Summer Reading Program as well! We are so proud of our new TinkerCrateClub. 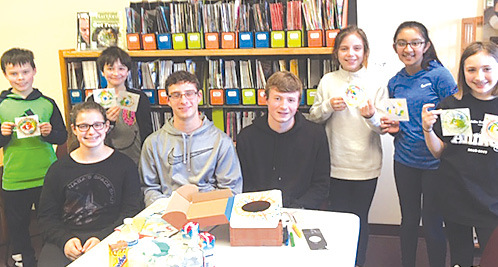 High School mentors Ryan Boudreau and Matthew and Jacquelyn LoVoi led the group through a STEAM activity resulting in a battery-operated art spinner. For more information contact wmitzel@suffield-library.org. KML Teens is working with Dan Spada (Suffield Middle) and Kristin Johnson (High School) to share our book collections with them on a special display in those school libraries. When we get it all set, students there can check out our books through the school system and return them there as well! Just another way the town works together to provide the best services we can! There is little time to catch our breath and work on spring programs. So far, things are shaping up with the following items for you to put on your schedule. Sign up for programs at suffield-library.org or call 668-3896. To be part of the Teen Program Mailing List, send an email to wmitzel@suffield-library.org. Don’t forget to thank a Friends of Kent Memorial Library board member for supporting all these wonderful programs with the town book sale each Fall! Study with a Puppy! Tuesday April 2 from 6:30–8 p.m.
There’s no reason not to head over to the Suffield Youth Center for a night of homework, pizza, ping pong and therapy dogs! Reduce stress and make new friends. Sign up or drop in! The Youth Center is located in the back of the Suffield Senior Center on Bridge Street. Tinker Club: Tuesday, April 9 from 3:30–4:30 p.m. Grades 5-8. The second Tuesday of each month will feature a new STEAM project for boys and girls to put together as a team. Sign up at suffield-library.org or call 668-3896 as space is limited. Please email wmitzel@suffield-library.org for more information. Held at KML. April 10 is the first date of our new series that will partner with school and town leaders and employees to give students a voice in Suffield! Let’s kick it off with First Selectman Melissa Mack. Grades 6 and up are invited. Students at the high school can ride the bus over to SMS for this 2:30 p.m. meeting of the minds. Sign up or drop in. Poetry and Peeps! It’s a Peepapalooza! Everything Marshmallow Peeps will help inspire silly (or serious, but why?) poetry. April is National Poetry Month and let’s prove poetry is NOT BORING! There’s plenty more information on National Poetry Month at www.poets.org/national-poetry-month/home.